"Undefeated," the Oscar-nominated documentary from directors Dan Lindsay and T.J. Martin, follows the highs and lows of the Manassas High School football team, in the inner-city community of North Memphis, Tenn. As the Tigers strive to chalk up the first playoff win in the school's 110-year history, the film lays bare just how much human drama underlies the drama that we as sports fans experience and enjoy. The film focuses on four key personalities on the team: Coach Bill Courtney, a local business owner who's been volunteering as the Tigers coach since 2004, a commitment that he acknowledges requires a huge amount of sacrifice on the part of his wife and four children; star offensive lineman O.C. Brown, a 300-pounder who moves like a panther and hits like a sledgehammer, but must live with an assistant coach's family to get his grades up; Montrail, aka "Money," the absurdly undersized defensive lineman with a 3.8 GPA and a deceased father whom he still misses dearly; and Chavis, a chiseled mass of muscle and rage who's fresh out of juvey and is ready to blow a fuse at a moment's notice. 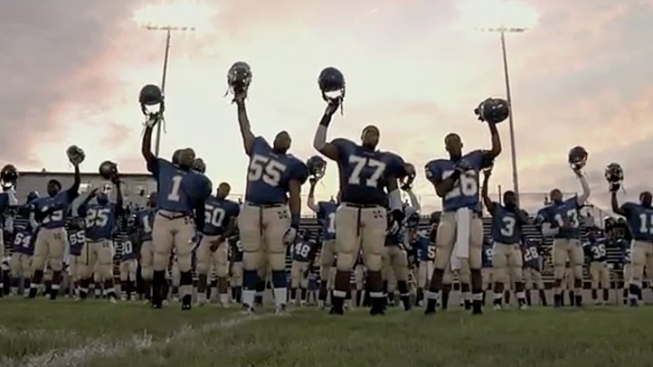 Unlike most documentaries that are conceived as looks back, where filmmakers try to cobble together a cogent narrative from archival footage interwoven with talking-head recollections, "Undefeated," (like "Hoop Dreams" and others before it) works as well as does it because Martin and Lindsay are there on the ground as the action develops. They are there for the doctor visits, the fights, the scoldings, the tears, the triumphs and trials… Nothing is made up or misremembered. Courtney is an amazing figure, a man who was raised without a father, and remembers vividly the pain of that absence, which drives him to go above and beyond the call of duty for his players, many of whom are also fatherless. And Courtney is self-aware enough to see the irony in the fact that his commitment to these kids keeps him away from his own children. His ability to reach his players is as miraculous as his personal sacrifice, as he crosses barriers of race, class and age to get through to them. Watching the effect Courtney has on his players would be inspiring if he didn’t make you feel so insignificant. Who knows what will ultimately become of the dozens of kids who have played for him, but for a few months each year, Courtney manages to make those kids be the best they can. "Undefeated" stands as a testament to the uncompromising drama of sports, as it peels back the layers of human drama that make the most mundane inner-city football team the most important thing in the world for two hours. You don't need to be from Manassas to be moved by this film—hell, you don’t even need to like football.